The “success” of our lives in America was killing us. My husband Michael and I were tired of living a life where there was just too much order and discipline—and too many adults spoiling the fun. So we decided to start a new life in Costa Rica. We’re now enjoying a different kind of success—one that emphasizes quality of life. It was the best decision we ever made. Instead of the urban sprawl that had engulfed our lives in Dallas, we now live in something that seems more like Shangri-La than the real world. That special place is in the mountains of the Orosi Valley, about 20 miles south of the Costa Rican capital, San Jose. You’ll see some glimpses of where we live and hear about how different our lives are now. So, if you feel like we did, watch the video. In less time than you can wait in line at Starbucks for an overpriced cup of coffee (that doesn’t come close to what we get straight from the fields here) you’ll hear our story. Orosi is one of the oldest communities in Costa Rica. Long before the arrival of the Spanish conquistadors, the lush Orosi Valley, with the meandering River Reventazón at its floor, was home to the indigenous culture. It remains one of the few areas to have survived the successive earthquakes that have shuddered much of the country during the Spanish colonial period. Due to its location in the center of the country, the valley’s weather patterns are influenced by both coasts. This results in a luxuriant profile that lays fertile ground both metaphorically and literally, and thereby propels the area’s economy, which hinges on tourism, farming, and coffee production. While the area is more rural, it is a favorite getaway spot for the upper and middle class Costa Rican. 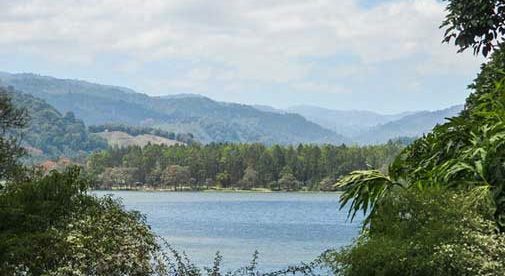 This is not only due to the area’s naturally arresting beauty and charm, but also because there are myriad high-end restaurants, spas, thermal pools, state parks, historical ruins, and the scenic Lake Cachí, which is covered in a lacework of water hyacinth.